This is one of the 'stinky plant' relatives that you see in the news once in a while. The flowers are pollinated by flys and most have a distinctive carrion smell. This one has little or none of that smell. The flowers start to appear in the middle of spring and it can bloom all the way until winter. The flowers of this one don't seem to attract flies (probably because they don't smell, Einstein) and have never produced seed for me. Not that they need to, because this plant is tough by any standards. I've had cuttings sitting out for over six months on a shelf outside. Oh, sure, they looked terrible, but they grew just fine after planting. 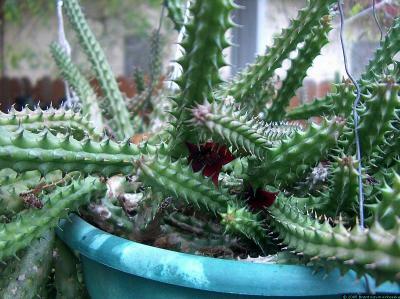 Huernia hislopii can take below freezing temperatures in south Texas. They can go without water for much longer than you'd think possible, just sitting there shriveled up and ugly. They can take floods and constant watering, as I threw some of my kajillion cuttings at the base of a palm tree that I keep moist (which is the only time I've lost Huernia hislopii to rot, although it was localized to a few stems and the rest of the clump was fine). I have so many Huernia hislopii that I've ended up with them all over my property. They've established healthy colonies into potting mixes and solid clay, and although the clay-grown batches don't look as nice, they still grow. Ideally, I give Huernia hislopii the standard well-drained potting mix, watering well in the spring through late fall, letting them go dormant in the winter. They like as much sun as you can give them. I've never seen a pest of any kind on them.